Frank Lloyd Wright is an American icon without peer in the architectural circles of the world. No other architect in our nation’s history has left such a mark on this country and indeed, the world stage, as did this complex man from Wisconsin, whose life began in the horse and buggy days of 1867 and ended at the dawn of the space age in 1959. He literally saw the world evolve from the primitive to the modern and he helped the world make that transition with the fabulous structures that he drew from within his mind. His buildings and constructs endure today, as do his ideas and style, which a multitude of architects have chosen to emulate as they study in the footsteps of the master. I don’t know when the love of architecture first came over me but some of my earliest memories, those of my mother as she sketched, drew, designed, erased and moved paper furniture around on graph paper pads surely had to have lit a spark somewhere. As a child, I remember my first trip to Disney World in Florida and seeing the Contemporary Hotel with the monorail running through it and was amazed at this building so futuristic and so simple in design, yet striking in its form and balance. Later that day, when I first saw Tomorrowland, in all its Jetson-era future modern style that was so popular in the 1960’s, I felt I was literally standing in the future. Suspended trams ferried visitors to different parts of the theme park; circular buildings and Brutalist architecture rendered in glass, concrete and shining aluminum abounded; water ran down pebble sided buildings into pools of water. Everything looked so forward, so optimistically hopeful of a future where human beings were free of the mundane and could focus on intellectual pursuits. This was the tomorrow where I wanted to live. It apparently was where Wright wanted to live as well, because his vision of the City of Tomorrow was very similar to this, even if he had drawn it decades earlier. Wright attempted to bring much of that into his designs but he stopped short of the cold and clinical look of most modern architecture. He felt that a building should blend with its environment; that one should be able to bring the outdoors in and he designed purely modern buildings rendered in both manmade AND natural materials. Native stone and wood blended harmoniously with concrete and steel, each complimenting the other. Glass, artfully rendered, was always used but oftentimes, was placed above a person’s view only as a way to let natural light in and thus, high enough so that curtains were not needed. Windows that were of suitable height to actually allow one to view the outdoors were placed exactly where Wright wanted you to look. This was something else Wright was known for…his ability to engineer every element and aspect of his design in such a way that you were compelled to focus your attention at what he wanted you to see before all else. My father-in-law is a professor of accounting at Florida Southern College in Lakeland, Florida and when I was newly engaged to my wife, we travelled there for the first time together to meet her parents. During our stay, he took us on a tour of the campus, the bulk of which is made up of buildings designed by Wright himself. I was very excited because I had never before gotten to see a true Wright structure in person and I looked forward to finally experiencing the work of this genius for the first time in my life. Moreover, Florida Southern is the largest single-site collection of Frank Lloyd Wright structures in any one location, anywhere in the world so for me, this would be like the Holy Grail of Wright works. When we arrived at the campus and I first saw the collection of buildings in one place, I felt like I was back in Tomorrowland for the very first time and spread before me was a veritable buffet of buildings to see, reminiscent of a Sunday dinner where the dinner table is laden with so many choices that you don’t know where to begin. From the colonnaded esplanades that meandered across the campus, we began, each pathway leading to a new architectural treasure to see. The esplanades were my first indication that despite Wright’s larger-than-life persona, he was in fact a very short man and he designed things to his own scale of height-everyone else just had to make do but few ever complained-you just accepted that this was Wright and you lived within his vision. After seeing some of the academic buildings from the outside, most of which were closed for Saturday, we arrived at the Annie Pfeiffer chapel, a landmark Wright structure and one of the most interesting on the campus. A conglomeration of angles seemingly at odds with one another, yet balanced and symmetrical stood before me, complete with jutting cantilevered balconies, Wright-designed bricks imbedded with colored glass squares and triangular staircases leading in. Standing in the presence of this magnificent edifice was exciting enough but what waited inside was stunning. Wright was a master of making use of interior spaces and the chapel was no exception. Like many of his buildings, you enter into a low area that the opens up into the interior vista. The soaring interior of the chapel took my breath away, seeing the great open space, the daylight pouring in from the skylights, yet diffused by the iconic steeple spire that covers the skylights-a spire that the students sometimes refer to as “God’s bike rack” because from certain angles outside, that is what it looks like. The light also came in through the colored squares in the brick and I couldn’t help but think of a “Lite Bright” I had as a child, each square of color glowing brightly and helping to illuminate the darker surrounds of the chapel interior. Add to that the coolness of the space after coming in from the hot Florida sun and I didn’t want to leave. Seeing this, the only thought I could come up with was that the man was a pure genius and nothing said that quite as well as this chapel. If I was a fan of Wright before, I was a disciple now and I understood why scores of architects and fans of architecture had been drawn to him and wanted nothing more than to study his work and emulate his greatness. I have since been back at least four more times to see the chapel, the other buildings and the Water Dome, which was designed by Wright before the technology was up to the task of making it work. Modern advances finally made it come to life in the last couple of years. Ten years after my first experience with a Wright structure, I was about to enter one I had always dreamed of seeing and which I had put on my bucket list of things to do before I moved on. There are two buildings which Wright designed that are his most famous and well-known structures; Fallingwater, which may be the most famous house in the United States and the building I now stood before, drinking in every detail of his last and probably greatest achievement of design. 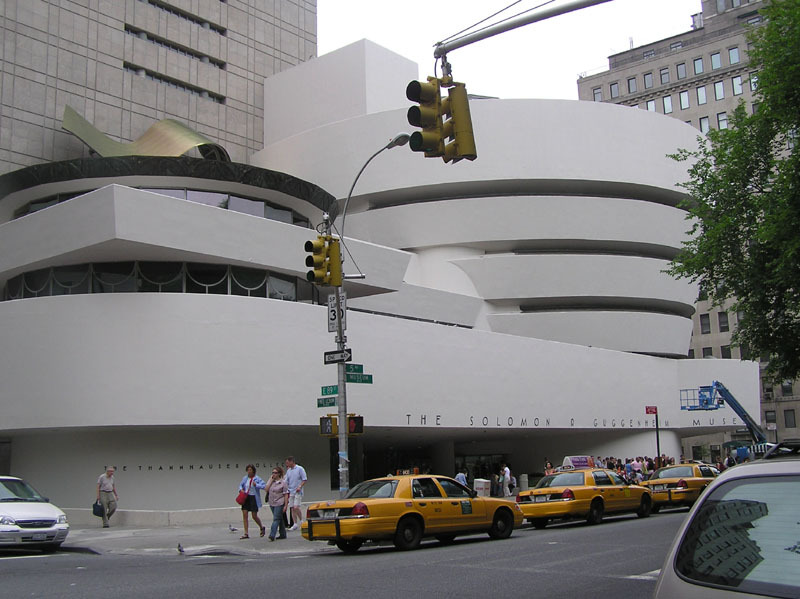 The Solomon R. Guggenheim Museum in New York City is probably the only museum in the world where the building itself is more famous than the artworks which it houses. As I waited to get inside the museum, I was awestruck at the modernity of the design of a building that was celebrating its 50th birthday that year. Even now, it is still ahead of its time and is unique in the world of architecture. Its inverted gallery, soaring several stories high, reminds one of a beehive, each level reached by a gently sloping ramp that curves around the circumference of the building until it reaches the clerestory oculus, a giant round skylight of white glass that fills the museum with natural, diffused light. Needless to say, while most of the visitors were admiring the art, I was admiring the building itself; the art was nice but the museum was the centerpiece and always has been. I have always been convinced that out of billions of human beings born over time, certain individuals have been touched with divine inspiration or gifted with creative insights and abilities that the rest of us can only admire and appreciate but never understand. Beethoven crafted masterful and powerful music that two and a half centuries later still has not found peer. Einstein peered into the world of physics and wrapped his mind around the principles and laws of the universe and the best physicists in the world still follow his teachings today….and so it is with Wright. His talents, his abilities and his architectural acumen knew no boundaries, even into his 90’s. His ability to extract what he saw in his mind and transmit that to paper and then to translate from paper into brick, mortar and stone the monuments of his profession, elevated him to legendary status in the circles of his peers and his admirers and unlike the music we can hear or art we can look at, we can experience what he made, within and without. Wright was a master architect, a complex individual, a flawed man, a narcissist even, but he changed the world in which we live in and how we live in it. Volumes of work have been written about his works, billions of dollars raised to preserve them and countless lives touched by having seen and experienced the works of a true master, one of which was mine. Not too bad for a lifetime’s work, huh?